What Technicians need to know about function, types, location, diagnosing and testing camshaft position sensors on single and multi-camshaft engines. All sequential EFI fuel injection systems plus all Variable Valve Timing (VVT) mechanisms and including direct fuel injection systems require the PCM to monitor single or multiple camshaft position data to ensure all the systems function correctly. This may range for the purpose of sequential fuel injection timing only or may include the requirements for ECU triggered ignition coils and if applicable monitoring VVT control. A technician requires to identify which system is utilised on the vehicle for diagnostic purposes as phasing of CAM and CRANK sensor signals should alter on VVT systems only during operation. 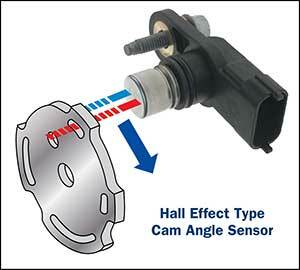 Note: Image shows both Camshaft sensors are correctly aligned (within tolerance) with the Crankshaft position sensor. Location points on the engine for CAM angle position sensors. The location points for CAM position sensor/s will generally vary depending on the valve train configuration and the engine system requirements. A vehicle with sequential injection system and single camshaft would require only one CAM position sensor. As an example, this sensor may be located on the front timing cover area – VS-VY Commodore 3.8Ltr. Other locations for these single camshaft systems may be the front or rear area of the Camshaft “or” an assembly driven by the Camshaft, typically AU Falcon V8. Typical location at front of camshaft. A vehicle with sequential injection and VVT may have two or four CAM position sensors depending on the number of camshafts and /or engine management system requirements. 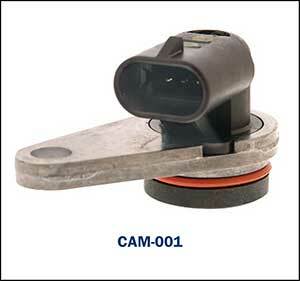 These sensors may be generally located at the front or rear areas of the related camshaft. The BF/FG 6 cyl utilises 2 units at the rear of the cylinder head area. One for the inlet camshaft. One for the exhaust camshaft. The VZ/VE Commodore 3.6 Alloytech utilises 2 units at the front of the engine, one for each inlet camshaft. The VZ/VE Commodore 3.6 Alloytech 190 utilises 4 units at the front of the engine, one for each camshaft. Types of expected CAM position sensor signals. Depending on the vehicle being worked on, the CAM sensor may create a Digital Hall signal or an Analogue sign wave signal. Testing CAM position sensor signals when a fault code has been logged. Whether a vehicle can start or not, there are many causes of a logged CAM sensor code that may or may not be caused by a CAM sensor malfunction. It is advantageous for a technician to understand the function of the CAM sensor for that specific vehicle system and the effect on vehicle operation. If there is a signal created by the CAM sensor. If the signal is correct. Typical test equipment required for CAM signal. Current clamp for specific crank testing if required. Note: Out of phase conditions may be caused by worn timing chains (known as stretched chain in the industry) or worn timing chain guides / gears or malfunction in the VVT system or incorrectly aligned camshafts when new chains fitted. (This also includes similar timing belt malfunction conditions). Visual inspections for valve timing may be very time consuming on some engines and Current clamps may assist during cranking to determine individual cylinder compression effects on the starter motor. Typical “vehicle out of phase performance” may result in engine misfiring or a no start condition with fault light and codes activated. Renewing a CAM sensor will not rectify this condition. Determining the cause of incorrect phasing and its correction is required to satisfactorily repair the vehicle. The Premier Auto Trade Sensor range includes more than 200 Cam Angle Sensors (CAM) from the world’s leading manufacturers, covering over 12 million vehicle applications in Australia and NZ.